Description The Talon is a further development of the Rotorway Exec 162F. Following cockpit technology trends, the Talon is equipped with an all glass cockpit. Remarkable is the fact that Rotorway decided to replace the tail rotor belt drive system with a shaft-based one. The main drive system has also been replaced with a heavy duty cog belt. The Talon is only available as a kit helicopter. 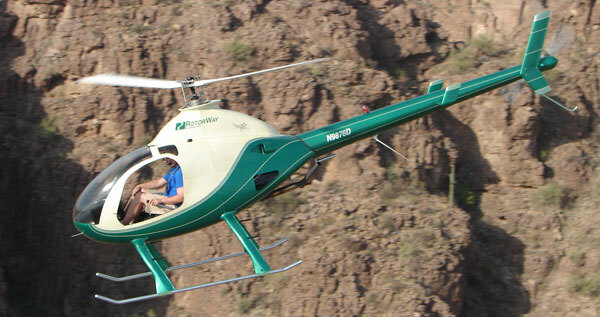 However, Rotorway is implementing a type certification program for this aircraft. This reveals a new market approach by Rotorway, while the program itself will undoubtedly help to increase the A600 Talon's safety standards. The Talon is a further development of the Rotorway Exec 162F. Following cockpit technology trends, the Talon is equipped with an all glass cockpit. Remarkable is the fact that Rotorway decided to replace the tail rotor belt drive system with a shaft-based one. The main drive system has also been replaced with a heavy duty cog belt. The Talon is only available as a kit helicopter. However, Rotorway is implementing a type certification program for this aircraft. This reveals a new market approach by Rotorway, while the program itself will undoubtedly help to increase the A600 Talon's safety standards. Do you want to comment the Rotorway A600 Talon helicopter?